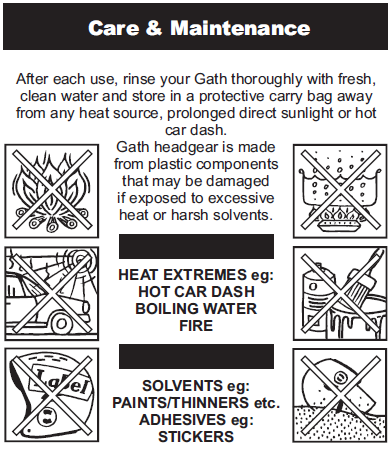 The use by date of your Gath is dependent upon the frequency of use, exposure to the elements, proper care and maintenance. Like all plastic products, it has a usable life span. However, if your Gath is subject to more sever impact and there is visual damage, we recommend you to replace it. If your Gath helmet components are showing any sign of damage or weakness, we recommend you to replace the components through your local distributor/dealer. if this is not possible, please contact us direct. What GATH should I buy? Gath is now available in 5 models. The benefits or performance level you expect from your GATH helmet. 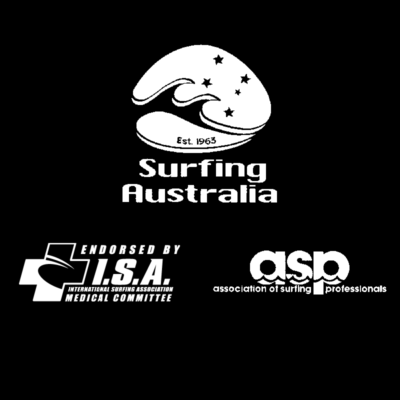 If your sport is IN THE WATER and WAVES, Surfing, Body Boarding or similar wave sports, a close snug fit is important. Surfers choose the Original Gath Hat Neo, Gath Hat EVA, Gath RV or Gath SFC (Surf Convertible). If your sport is ON THE WATER and involves high speeds, Windsurfing, Kite Surfing, Jet skiing or similar sports or activities, and your preference tends towards a Gath with a higher level of head protection, then the Gath Gedi may be your best choice, however many still choose any one of the five unique Gath helmets. If you are purchasing a Gath helmet for FACE and EYE PROTECTION from the damaging UV SUN Light, then the Gath Retractable Visor or the Gath Gedi or SFC with peak or visor will serve you well. If you want head protection without ear coverage and as little bulk as possible, the Gath Surf Convertible (SFC) with detachable ear protectors will provide you a smart balance between impact head protection and lightweight comfort. All GATH helmets are unequally designed for water sports and provide the lightest, closest fit available to handle the more common thrashings in ocean waves or turbulent river white water situations, while still delivering a practical balance between performance and impact protection. Different Gath helmet models have different attachments: PEAKS, VISORS, DETACHABLE EAR PROTECTORS, WATERPROOF RADIO COMMUNICATION, ALTIMETER BASE PLATE AND COVER, WATER PROOF CAMERAS ETC. Gath recommends you visit our online shop to help choose a Gath that meets your needs. Gath recommends you visit your local Gath stockist and try on the different models and sizes of Gath helmets before choosing. If you are unable to find a local stockist with a range of Gath helmets then Gath recommends you carefully read the size guide to help you best choose the Gath helmet to suit your needs. If you require more information to help you choose the correct Gath, please contact us. Is your Gath RV too loose? Make sure the helmet cannot be removed from your head or rolled excessively backward or forward. GATH headgear is designed to fit snugly and provide maximum stability for your chosen water sport. Place a neoprene padding strip (125mm x 25mm x5-10mm) under the liner. Simply lift the helmet liner underneath the headband and carefully insert the padding strip. Replace the liner, pushing it snugly into place. Test the fit and add or remove padding as needed. I am a BIG PERSON with a LARGE HEAD SIZE, what Gath is best for me? The GATH Gedi may be best suited to your build. The Gedi is the largest fitting helmet in the GATH range, fits size XL-XXL (600-630 mm) and offers the highest level of impact. The Gedi helmet features Gath latest Comfort Strip Fitting System and can be sized up or down by adding different thickness comfort strips and is a better suited to a person with a large head size. The Retractable Visor helmet is a slightly smaller fitting helmet than the Original GATH helmet if your head size is XL – XXL you may find the fit of the Gath RV too tight and may be better served by choosing from the other five GATH models. I am an AVERAGE SIZE PERSON, which Gath helmets can I choose from? If your head size is SM-MED-LG or XL then you can choose from the complete range. I am a SMALL PERSON with a VERY SMALL HEAD SIZE, what Gath is best for me? The GATH SURF CONVERTIBLE (SFC) may be best suited to your build. The Gath SFC is the smallest fitting lightest helmet in the GATH range, fits XS-SM (530-560 mm) head size. The Gath SFC helmet features Gath latest Comfort Strip Fitting System and can be sized up or down by adding different thickness comfort strips to ensure a perfect custom fit, even for very small head sizes. How do I choose the correct fit? Fitting the Gath helmets on for size is recommended. Gath recommends you visit your local Gath stockist and after choosing your preferred model to try on helmets above and below your size to ensure you are choosing the correct size. 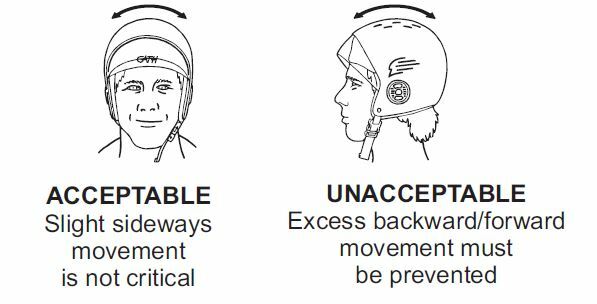 The helmet you choose must suit your head size and shape, fit firmly (not too tight) but comfortably and when correctly fitted you should NOT be able to push it back off your head. 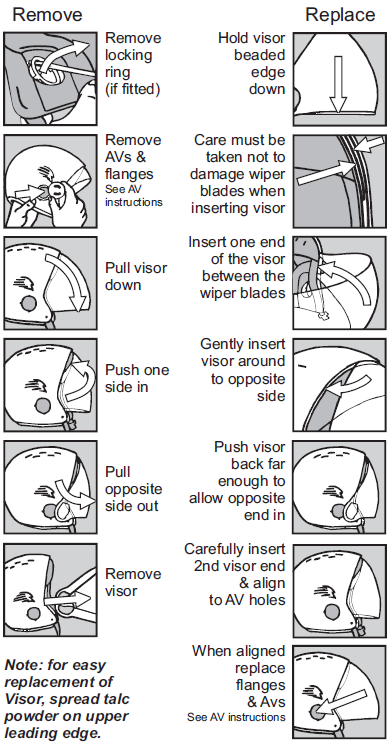 Helmets that don’t fit correctly and particularly helmets that can be dislodged even though they are correctly adjusted and strapped on are potentially dangerous. If buying on-line, refer to the gathsports.com Products page and the appropriate size chart below the helmet of your choice. If you do not know your head size use a material measuring tape or string (by transferring the length of string onto a standard tape measure) and measure your head size around the forehead just above your ears. This will give you a close estimation of your head size and the Gath helmet size you should choose. If you purchase your Gath helmet online and receive the wrong size, Gath Sports will gladly exchange helmets to ensure you get the correct sized Gath of your choice, subject to Gath’s on-line terms of sale, which basically means the helmet must be returned promptly undamaged and you pay for any additional freight charges. Gath provides the extra handling service free of charge to ensure you receive the correct Gath of your choice. The Gedi and SFC helmets feature Gath’s unique Comfort Strip Fit System and come with spare comfort strips to ensure you get a perfect snug fit. These Gath helmet models provide more adjustability and increase the success rate of choosing the correct size online. Where can I find a range of Gath Helmets to try on? Gath helmets are distributed throughout the world to over 50 countries and are generally sold through sports stores or surf shops. However, most shops only carry a small sample range of Gath Helmets and if they do not have your preferred size and model in most cases will order one for you. To find your leading stockist visit www.gathsports.com LINK click your country and local Distributors details, they will direct you to your leading stockist or supply you with the Gath of your choice. If you still have difficulty purchasing a Gath helmet you can buy directly from Gath Australia on https://gathsports.com LINK for the complete range of Gath or try e-bay or direct to [email protected] LINK for a range of custom sprayed Gath helmets. I notice the Gath helmets are very flexible and lightweight, HOW STRONG are Gath helmets compared to other lightweight sports helmets? This article total supports the FLEXI DESIGN CONSTRUCTION, the same design principle Gath has been incorporating since 1988 and continues to stand by today. It is the same design principle adopted by car manufacturers many years ago, a car that partially crumbles will absorb the impact energy better than a more rigid car that will not crumble, the impact energy is transferred, rather than absorbing and dispersing the force of the blow. Gath helmets have been used by the world’s elite sports professionals and sports enthusiasts in a large number of extreme sports and weather conditions that test a helmet to its limits in both strength and durability and impact absorbing properties. Gath’s IMPRESSIVE 20-year safety record speaks for itself and is supported by the numerous testimonials from customers claiming their Gath has saved them from serious injury or even saved their life. 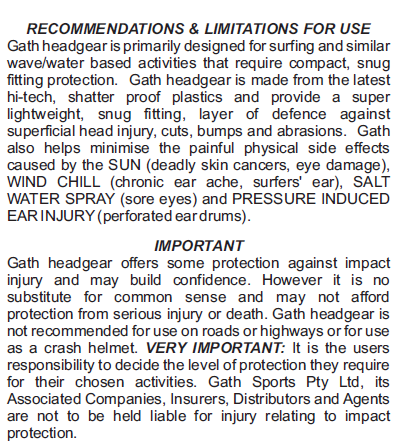 Even though Gath does not recommend use of Gath helmets for cycling or for other land-based sports, and Gath’s range of helmets have not been submitted for testing to cycle standards, this and many other real life incidents that the Gath helmets have withstood supports the Gath FLEXI DESIGN construction and suggests that impact properties exceed intended use. I am interested in the Gath Retractable Visor but does it bucket water with the visor completely down and does the plastic visor crack? The bucketing question is a common misconception, it appears as if it would but in fact, there is little to no bucketing of water even when going feet first into the water. The RV has been used in extreme surf and whitewater situations since 1992, some 17 years now without any negative feedback. The plastic visor in made from quality high impact shatterproof polycarbonate plastic (PC) that provides more than 98% UV protection. 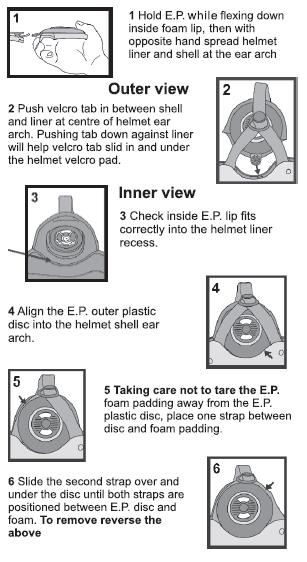 The early Gath RV helmets had drilled hinge holes and a small number developed fatigue across the holes resulting in a small portion of the visor end coming off but caused no problems to the performance of the product or danger to the wearer. Since 1997 the hinge holes have been moulded eliminating the early model fatigue point. 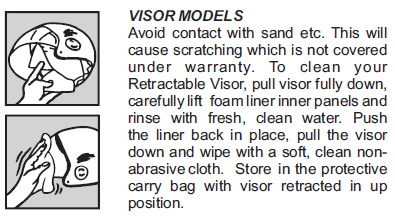 In very rare occasions visors made from PC may develop a small crack for unknown reasons but do not shatter and have proved to be a safe material for sports visors. Difference between Gath NEO hat and Gath EVA hat? Original Gath Surf Hat now comes with the option of two different headbands. Gath NEO hat with Neoprene Headband (3-4mm thick wetsuit material). Gath EVA hat with EVA Headband (10mm thick), the same material as the helmet’s foam liner. The Original Gath NEO hat with Neoprene Headband is well known for its comfortable snug fit and excellent performance in the Surf and Sky. The patented high cut shell and expandable headband combine to provide an automatic close comfortable fit and after 29 years is today still the preferred choice for many Gath buyers. This model is ideal for the more common head shapes. But head shapes with a long or high forehead do not fit this model well, as the helmet can sit higher or further back than intended. The latest model GH with EVA Headband features Gath’s unique Comfort Strip Fit System which combines with the EVA Headband and allows for a perfect custom fit even for the more uncommon high or long forehead shapes. The 10mm thick EVA Headband also provides added forehead protection against impact injury. If you have a high or long shaped forehead and wish to purchase a GH, then the GH with EVA Headband may be more suitable. Both model GH Helmets are bought for the same sports and are equally as popular, it is a matter of head shape and personal preference to which you should choose. Gath recommends you try both models before choosing. When the helmet is new, the Audio Vents may be a little tight. 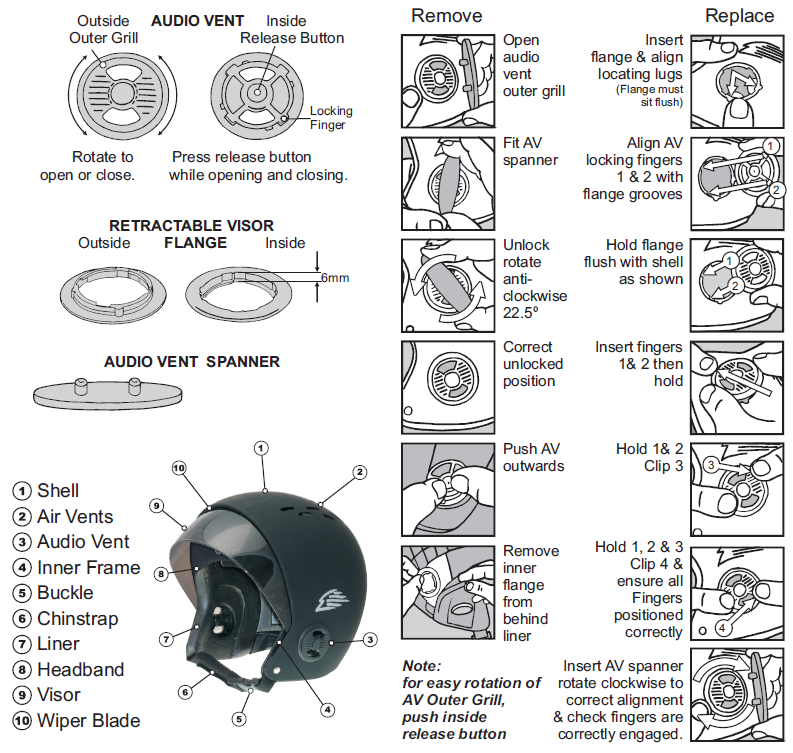 To open and close the Audio Vent Outer Grill easily, push the centre of the Audio Vent on the inside of the helmet while turning the outer grill. Once they have been opened and closed a few times rotating the outer grill becomes easy. Which Gath helmet is suited to my extreme sport (be it surfing, kitesurfing, windsurfing, whitewater, wakeboard, free falling, base jumping)? This is a difficult question to answer quickly because there are choices to be made. The final decision will depend on your sport or activity, your build, head size and shape and your personal preferences. It will also depend upon the reason you are choosing to wear a helmet. Whilst impact protection is a primary consideration, it is not the only consideration for water sports enthusiasts. For example, a helmet with a seemingly high level of impact protection may not serve you well in a serious accident situation if it doesn’t well fit your head, moves around too much, degrades quickly – or if it is poorly designed and constantly slips after only a short time in use. For example, a helmet with a seemingly high level of impact protection may not serve you well in a serious accident situation if it doesn’t well fit your head, moves around too much, degrades quickly – or if it is poorly designed and constantly slips after only a short time in use. Whilst impact protection is a primary consideration, it is not the only consideration for water sports enthusiasts. For example, a helmet with a seemingly high level of impact protection may not serve you well in a serious accident situation if it doesn’t well fit your head, moves around too much, degrades quickly – or if it is poorly designed and constantly slips after only a short time in use. There are also other demands by today’s extreme sports enthusiasts that are not as critical for a land based helmet, but vital for a well-designed water sports helmet. Some of these include good peripheral vision, options for hydrodynamic sun protection, ear and eye protection, good water drainage, the ability to wear continuously when wet without becoming too heavy causing discomfort or potential for repetitive strain injury. These are also important safety considerations. Surfing and similar “in the water” sports involving frequent heavy pushing through waves or heavy turbulent water contact, requires a close-fitting helmet that delivers a balance between impact protection with little to no bucketing effect. Perhaps the best way to answer the question is to point out some of the design and protective benefits of each model. These benefits, combined with the way a particular Gath model fits your head, should be the deciding factors. All Gath helmets – when compared to many other brands. Chosen by: Paddle Sports enthusiasts, including Whitewater. Tow-in surfers, PWC operators, kitesurfers, windsurfers, wakeboarders, waterskiers, riverboarders, base jumpers, swoopers, wingsuiters. A good level of impact protection for the more regular surfing injury mechanisms (boards, fins, reef) whilst maintaining low drag performance essential. Chosen by: Surfers, kitesurfers, windsurfers, wave skiers, sailing and yachting sports enthusiasts, surf kayakers. If this occurs, you will be contacted by the EMS operator in your country. If you haven’t received any notice, you can find out the local EMS operator’s contact details by click on this link. Surfers, Body Boarders and similar IN THE WATER SPORTS choose the Gath SFC(Surf Convertible) (280-305 gm), Gath NEO Hat(325-350 gm) and RV (460-510 gm) with an increasing trend towards the Surf Convertible, because it is the model with the least drag. SURFING and similar IN THE WATER sports involving frequent pushing through waves or heavy turbulent water contact require a close fitting helmet, the closest fitting GATH helmets are the Original Gath NEO hat, Gath EVA hat, RV(retractable visor helmet) and Gath SFC helmet. Although the Original Gath and RV are both close fitting and lightweight, the SFC (Surf Convertible) is the lightest Gath helmet available and has Gath’s latest unique fitting system which allows you to customise the perfect stable and comfortable fit. It comes with detachable ear pockets, ideal for anyone who prefers their ears uncovered, plus optional peaks or visors to suit all weather conditions. But many still choose the Classic Original Gath Neo hat for its outstanding comfortable wrap around fit or the Gath RV (Retractable Visor helmet) for it’s one of a kind full face adjustable visor. Wind Surfers, Kite Surfers, Sailors and similar ON THE WATER SPORTS choose similarly to Surfers with a trend towards purchasing the Gath RV for its UV protection and the Gath Gedi (350-410 gm) offering even higher levels of impact protection. The Gath Gedi also comes with detachable ear protectors and has all the same convertibility benefits as the SFC (Surf Convertible) with optional detachable peaks and visors while still retaining Gath’s unique close fitting comfort and stability. White Water Paddlers, Kayakers, Canoeists, Wave Skiers and similar PADDLING SPORTS choose the Gath Gedi, SFC(Surf Convertible), RV and Original Gath helmet with a trend towards the Gedi (EN 1385 Approved) and RV for on the river or Surf Convertible, RV or Gedi for on the ocean. Wave Skiers tend towards the Surf Convertible or RV. PADDLE SPORTS which may require a high level of impact protection against collision with rocks or similar objects should choose an EN 1385 Approved Helmet for White Water Sports or consult their local authorities for protection requirements. The Gath Gedi and Gath SFC (Surf Convertible) are accredited to EN 1385 in all sizes. Sky Divers and similar AIR SPORTS choose the Original Gath, RV or Gedi. The Original Gath and RV’s unique head glove fit remain the popular choice for sports that are exposed to extreme wind/air pressures. Water Skiing, Wake Boarding and similar BOAT SPORTS choose the Original Gath, RV or Gedi. Gath now provides a purpose built FLUORO ORANGE modified original Gath helmet design, with closed ear vents and goggle strap holders which is approved for use by ski racers by the Australian Water Skiing Association. Wake Boarders choose the higher impact protection and the skate helmet style look of the Gath Gedi. Sea Rescue, Jet Rescue, Military, Navy, State Emergency, Coast Guard, Water Police, Water Firemen and other similar PROFESSIONAL PERSONNEL choose Gath Gedi, RV, SFC(Surf Convertible) and Original Gath helmets. Enquiries are welcome to customise Gath helmets to suit Rescue and Professional activities special requirements. All Gath Safety Rescue Helmets are supplied in standard safety colours and, upon request, can be finished with reflective decals or corporate branding and can be fitted with special equipment including waterproof communication headset (bone mic/speakers) to suit most professional radios, waterproof cameras, headlamps or supplied with Gath customised non-corrosive mounting fasteners to allow customers to mount their specific attachments. Paddle sports which may require a high level of impact protection should choose an EN 1385 accredited model. 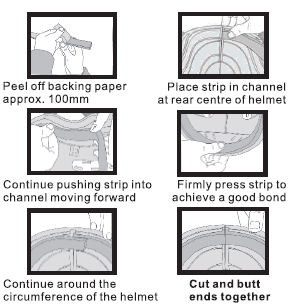 You should check the helmet you purchase has been accredited in your size, not just in a single size, which can be the practice for some manufacturers. The Gath Gedi was accredited in five sizes to EN 1385 in March 2007. Registration No. BP 60017615 0001. Report No. 21126628 002. Gath cautions that there are many injury mechanisms and situations in which a Gath helmet will not offer the level of impact protection required by skydivers. Skydivers continually advise us that they are extremists who enjoy the freedom of their sport. They tell us they understand that snug, close-fitting, lightweight helmets like the Classic Gath or the Gath Retractable Visor, popular with freefalling skydivers, may not sufficiently protect them in many skydiving accident circumstances, but that these helmets have other safety benefits that they consider essential to their activities, without compromise to the freedom of the sport they love. Good peripheral vision, lightweight, warmth, wind protection, protection from regular knocks and impacts associated with aircraft departure and freefall landing.